This post was originally about BuddyWay, a GPS tourist application. Since this app no longer exists, we’ve updated the article to discuss comparable Google Maps features for iOS and Android. You may have used Google Maps to get directions to an unfamiliar location, but did you know that it can do so much more? 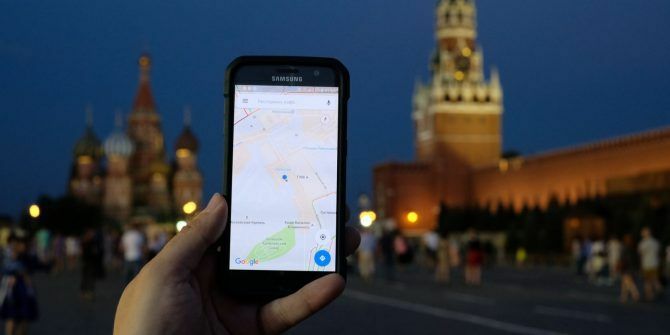 If you’re traveling, Google Maps offers several useful tourist features that utilize the GPS in your iPhone or Android device. Before you leave on your trip, make sure to set up real-time location sharing How to Track Friends in Real-Time Using Google Maps How to Track Friends in Real-Time Using Google Maps Google Maps now lets you share your real-time location with others. Next time you're running late, this will let them know exactly when to expect you. Read More with your friends. This lets you check where they are at all times, perfect for traveling. Doing so can help you find the best spots to check out, or just keep an eye on their safety. Another incredibly useful feature of Google Maps 16 Incredible Uses of Google Maps You Should See and Try 16 Incredible Uses of Google Maps You Should See and Try Google Maps is an incredible tool on its own. But some websites have tapped into it to create wonderful Google Maps applications. From Google Maps games to history and literature, we cover them all. Read More is the wealth of information it can bring you about nearby restaurants, monuments, and other attractions. Slide open the left menu in Google Maps and select Explore to see the most interesting sights around your current area. You can also tap the location marker icon in the bottom bar to search for Restaurants, Cafes, and more around you. Select a category and filters like Open now and Good for kids will appear. Once you find a place that looks promising, check out its Google Maps page for even more info. You can see when it’s typically busy, preview the menu, and read reviews from other customers. This gives you a heads-up if a restaurant is kind of gross or if that museum is way too busy to enjoy at the moment. Utilizing the power of Google Maps How Does Google Maps Work? How Does Google Maps Work? Google Maps is used by millions of people every day and you might be one of them, but how does it actually work and how does Google maintain its accuracy so well? Read More , you can supercharge your tourist experiences. Get info on local sites and be in the know without wasting any time — and it’s all free! Do you use Google Maps when you’re traveling? What other features are most useful for tourists? Tell us down in the comments! Explore more about: Google Maps, Travel. i want to catch my wife in act can i tracked his mobile number here in saudi arabia? how can i get the software for my cell phone and get someone to install it for me? I really like the features of this GPS Cell Phone Tracking Software.. I'm a kind of person who loves to go outdoors always.. and this will be indeed helpful..
then i tried calling it now but the operator says "the number you dial is incorrect"what is that mean? I lost my LK KP500 IMEI no 352701034304805 & LG KS360 IMEI no 354995034555063 today what can i do? there is still misunderstanding, many ask to track their lost or stolen mobile phones, however nothing canbe done now. I have lost my Sanke S1 model phone that is EMI No. is 355458000198391 . I lost my LG Cookie Mobile Phone Today At School or i think someone stole it. i dont know what to do, i costs over Â£100, it also has a Â£20 top up on it and it was a present for my birthday. I need something to track my children so I can find them when they stay out after curfew, how does this track do I have to install the software on their phone of can I just type in their phone number, or does this work if it is within blootooth range? I always like to see what other people are doing with GPS technology and cell phones. The likely hood of someone finding a cell phone by giving them the cell number is not very good. Most of these systems need to be installed on the device before you can track. When I send my trip to web site, how it happens? By web? My cellphone connect to internet to send it? Great about GPS cell phone tracker resource, thanks for sharing. Im not sure if you could help me, but I was woundering if you could find the location in the philippines of this number 011639165100577. I dont know how long it will take, but it would be great to know where the phone is. I lost my cell and people say it is in Mufresserburo and it is turned off. I called it and i got a voice mail. What do I do. If any one know this software work on CDMA phone? It's amazing the array of products available for parents to help monitor their children and teens now. GPS cell phone tracking allows kids to get the cell phone they want but allows parents to monitor their position via a computer. It gives parents piece of mind. My cell has been lost. I'm having trouble putting this on my Samsung A900. The browser keeps redirecting to the same page and not installing anything.